Learn how to pre-populate form fields inside of Landing Lion to save your visitors time and increase your conversion rate. Pre-populating form fields in Landing Lion is the process of filling out the fields ahead of time, on behalf of your visitor, if it is information you already have. For example, if a visitor has already shared their email address in a form or subscriber list, you can fill it in for them when you are asking them for new information on another page (like their company name). Note: This can be used for both the form component and subscribe component. 1. Get the ID for the form field you want to pre-populate inside of Landing Lion. Note: There are two types of form fields in Landing Lion – stock and custom. 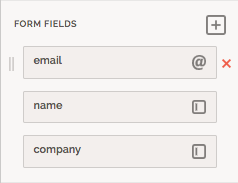 Stock form fields (as seen below) have a preset field ID and can't be modified. 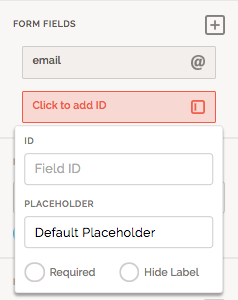 Custom form fields (as seen below) are unique form fields that you can create a unique field ID for. 2. 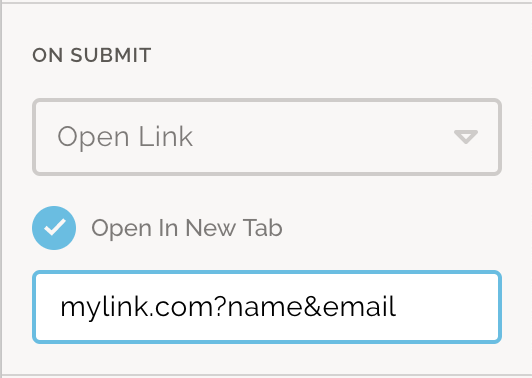 Append the ID (or field ID) for the form field(s) you would like to pre-populate on the next page to the end of your link/URL your visitor goes to after clicking the submit button. For example: If you have a visitor submit their name and email on a form to join a subscription list, and want to pre-populate the name and email field on your event signup page, then you would add ?name&email to the end of the link/URL that the visitor goes to after clicking the submit button. ⚠️ Caution: In order for this to work the form field ID on the current page must match the form field ID for the next page. For example: Using the example above – if the page you are linking to has a form field ID for name but it's "firstname" instead of "name", then the form field won't pre-populate.